We learned a trick to passing the border with minimal hassle. During a usual border process the passengers go through the immigration and then wait in a separate area while the customs officials inspect the car. This is what we do now, Hyein just follows me back to the car and sticks around. The officers tell her to go sit on a bench somewhere, when i tell them that at this point THEY have to make a decision. If they need to open the tent and do a thorough search, she stays because i cannot do this by myself. Usually, they look quizzically at us….how dare we give them an ultimatum? 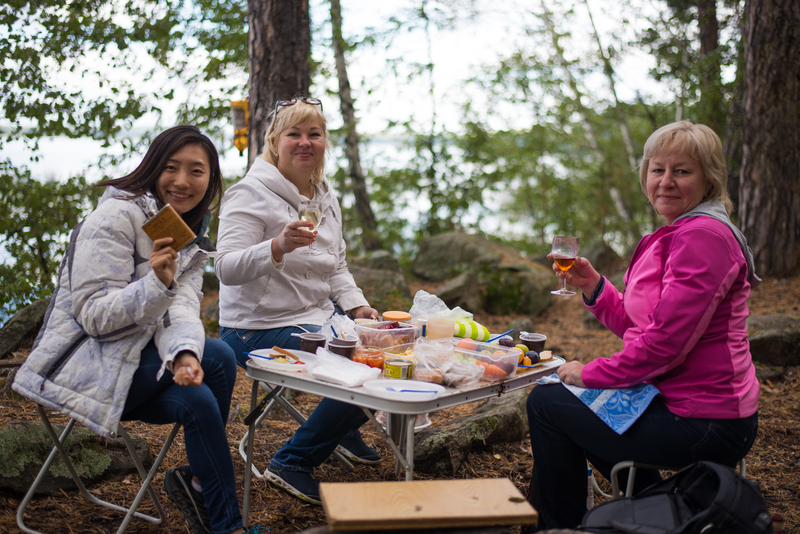 !….and then tell her to go sit on a bench while we finish the inspection in less than 5 minutes without opening the tent. 4 out of 5 times works every time! Yeah definitely out of the step and into the lakes and forests. The whole night we were driving and the visibility was getting worse and worse. I thought it was mostly because of the misty dirt from the road and other vehicles. In the morning we saw that our white tent has become a mass burial ground for mosquitoes. Just for the record…this is the most bugs we have collected in just a few hours of driving. The only other time i have seen it worse, was during a butterfly hatching event during spring in Alabama. Back then we needed to stop every 30 minute to wash our windshield by hand. You might wonder where we are heading now? 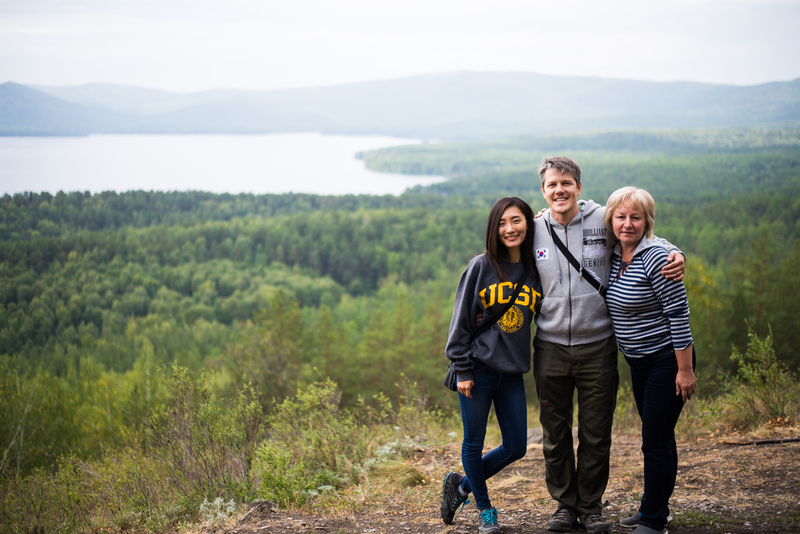 We leave behind the wild eastern lands of Siberia, Baikal and Taiga. The steppes and mountains of Kazakhstan and Kyrgyzstan are just a vivid memory in our buzzing minds. What is here, in the European part of Russia? If you are us…then a lot, if you are a foreigner driving through…not much just the history of birth of Russia. 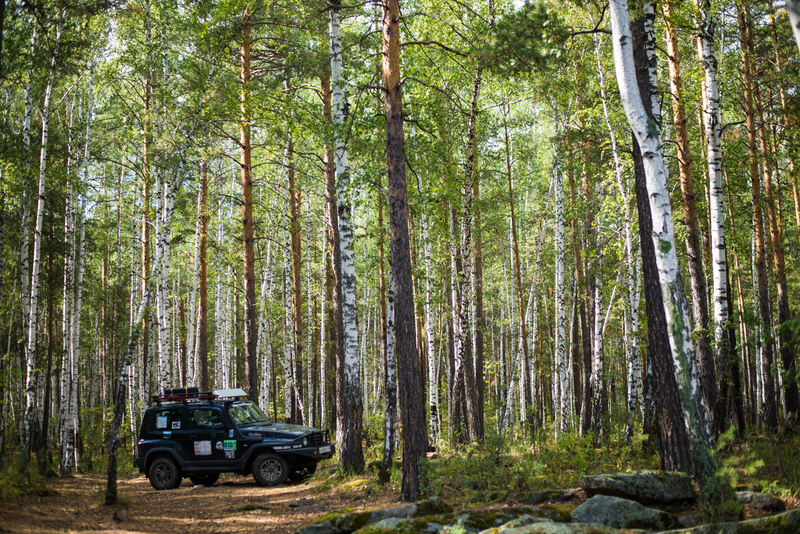 Today we are driving to Miass to meet our dear friends Boris and Marina. 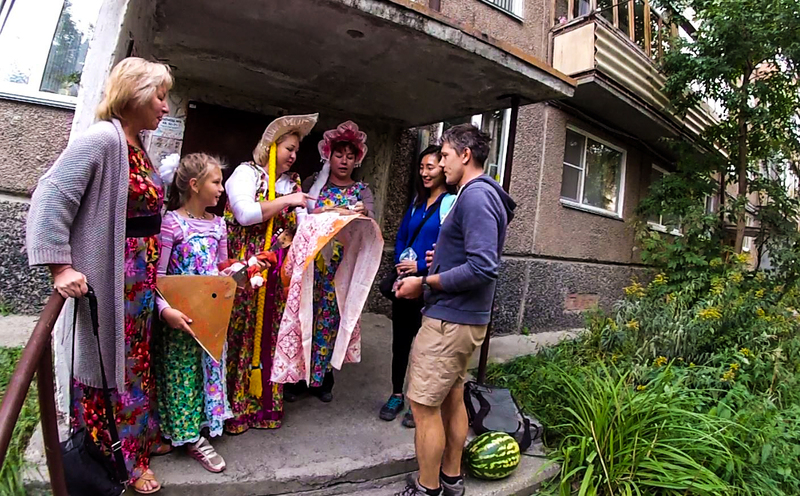 They were the first people we met at Korandovod and they insisted that they come and spend time with them. Not that we need much convincing. 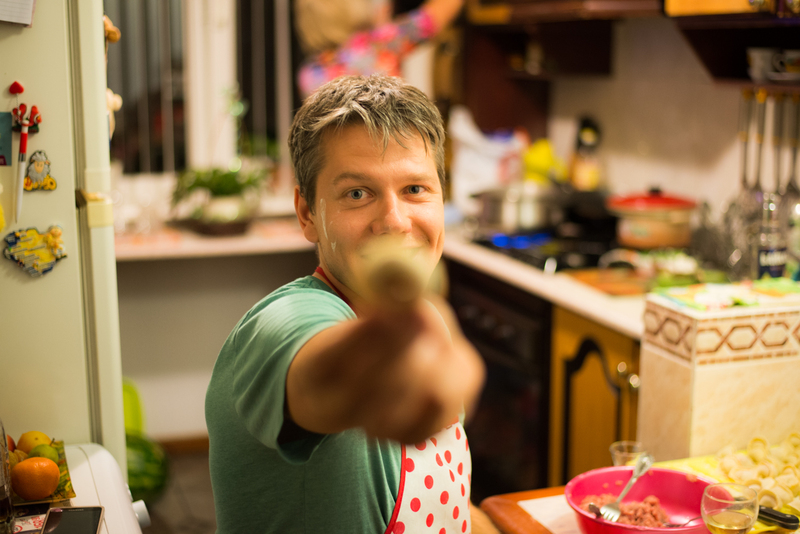 According to an old Russian tradition, you have to greet a dear guest with bread and salt. 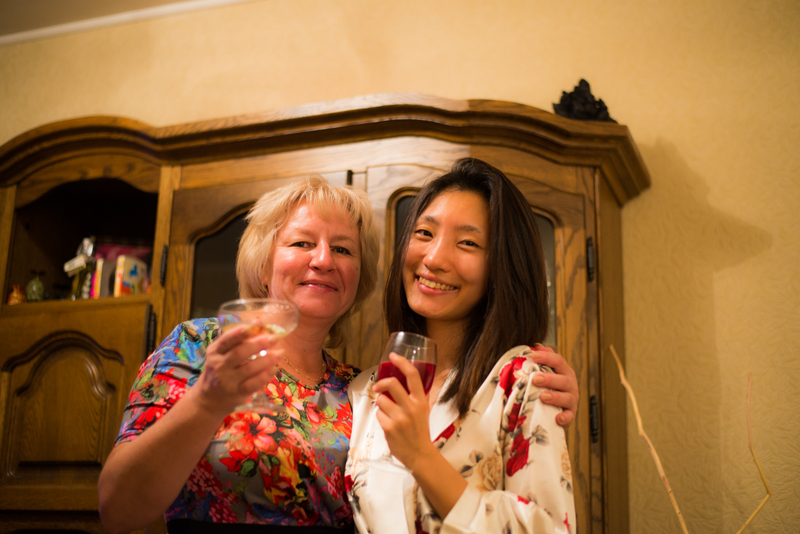 Olya, their neighbor and lifelong friend decided to spice up the tradition with original costumes and including a vodka shot…just to get things going for the night! 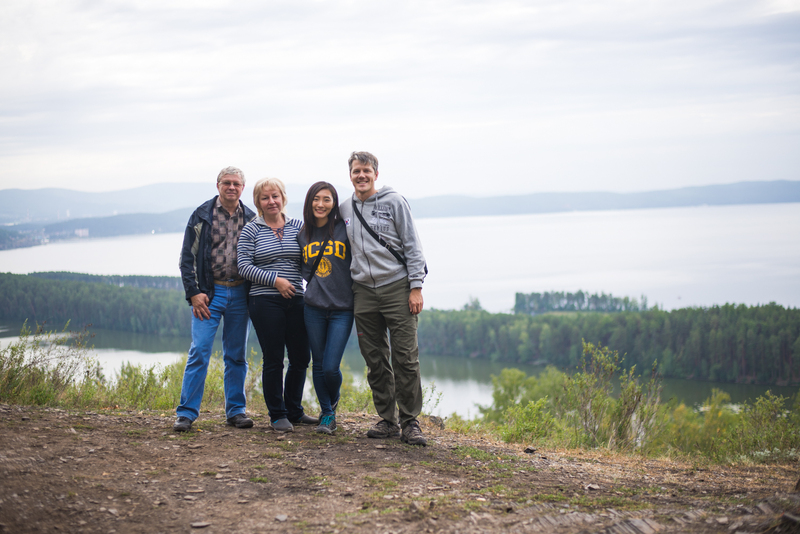 After that week on Baikal, it didn’t feel like we were coming home to a strangers house, it was more like coming home. You know the feeling of love and caring that you get when you visit your auntie and uncle, mom and dad…or cousin’s home? Avid travelers themselves, Marina and Boris realize that besides a good bowl of soup and a strong drink, the shower is the second best feeling. In the morning, a bit hunger over but hungry for knowledge we headed out to Boris’s office to check out the magic he has been brewing up in the lab. 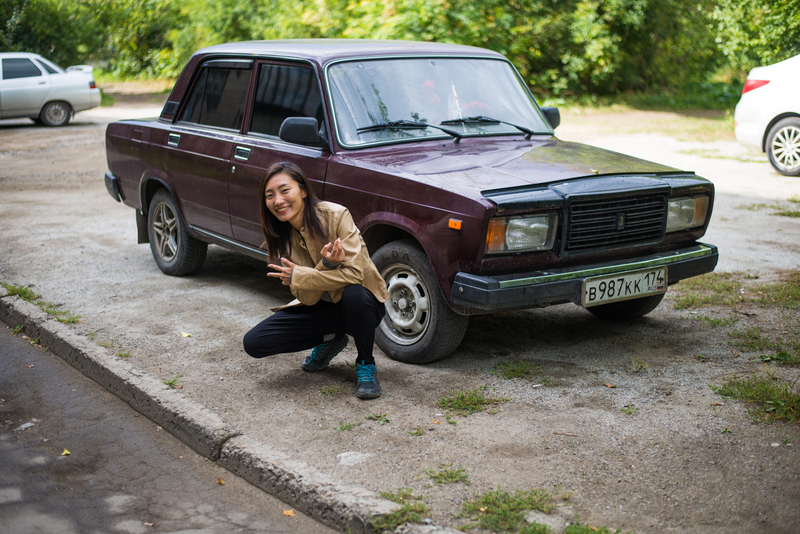 Still infatuated with “Lada Sedan – Baklajan” song when we saw one in real life we could not pass it by without taking a photo. This is Hyeins best and most innocent impression of a tough guy next to his cool ride. A bit about the town of Miass before we get into the orange robot you see in front of yourself. Back during commie times it was a “closed” aka secret town, where secret defense research into rocketry and rocket guidance systems. 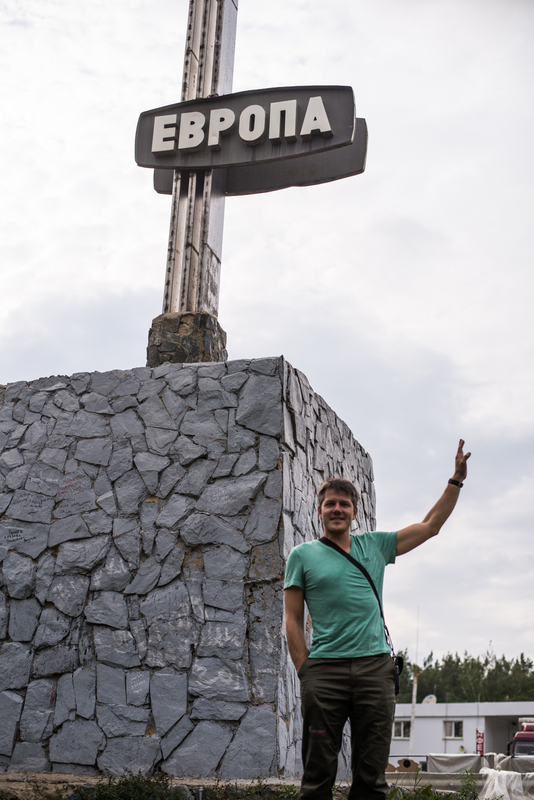 It also houses the manufacturing plant of UralAZ, the place where they make Ural trucks – https://en.wikipedia.org/wiki/Ural-4320 , crazy off-road vehicles. Now the town is no longer off-limits and two foreign agents like ourselves can easily come and go as we please. 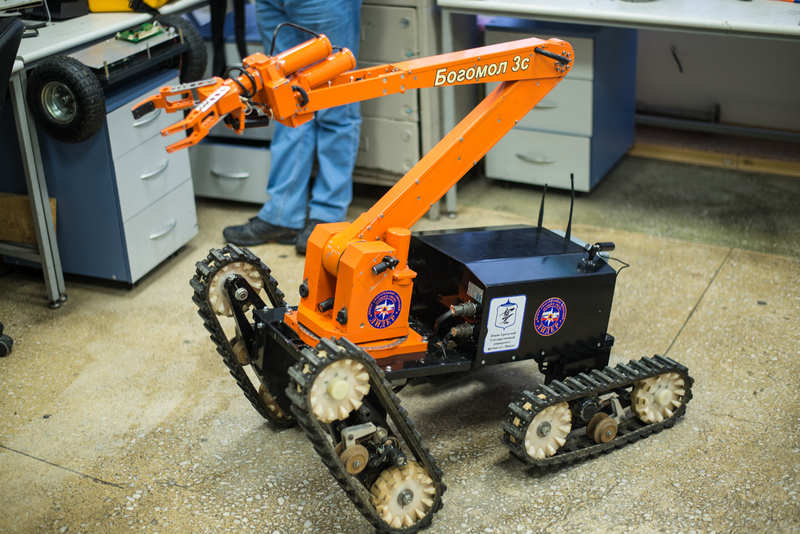 Now about the cool robot, its called “Bogomol” which means praying mantis in Russia. The base was originally design for dangerous work in defusing explosives in civilian and army uses. It has many different configurations, and can be designed to work in extremely high radiation environments such as Chernobyl reactor number 4. 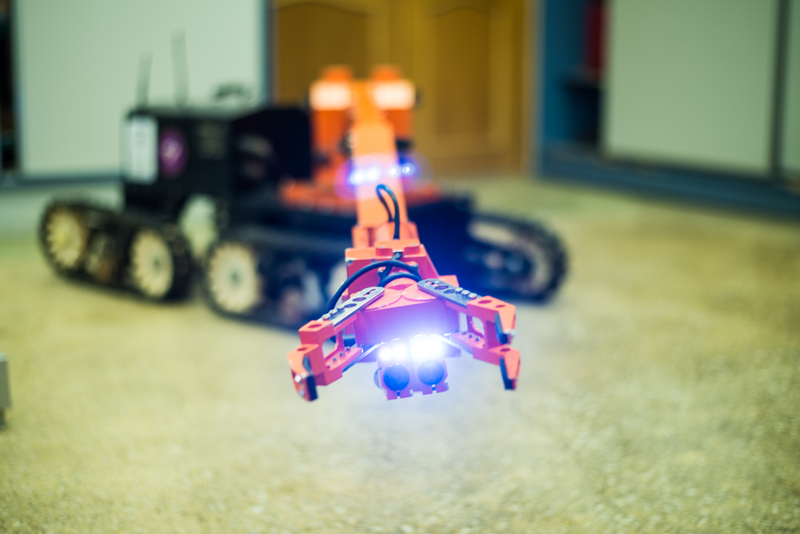 We played around with a robot amazed at its stereo vision and far reaching capabilities, then headed out to check out Miass and nearby Ural mountains. 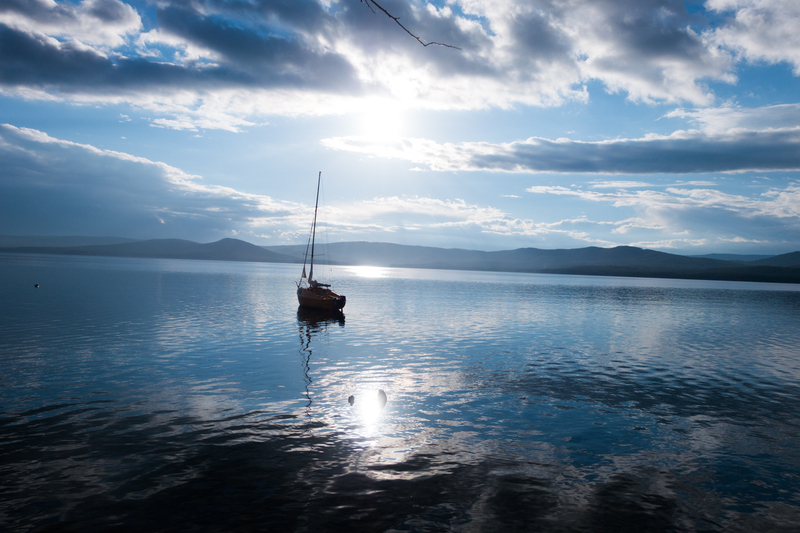 So what is there to see around here…lakes and mountains. Now i have to warn you that these are not the sky scraping peak of Pamir, but gentle slopes of Ural. 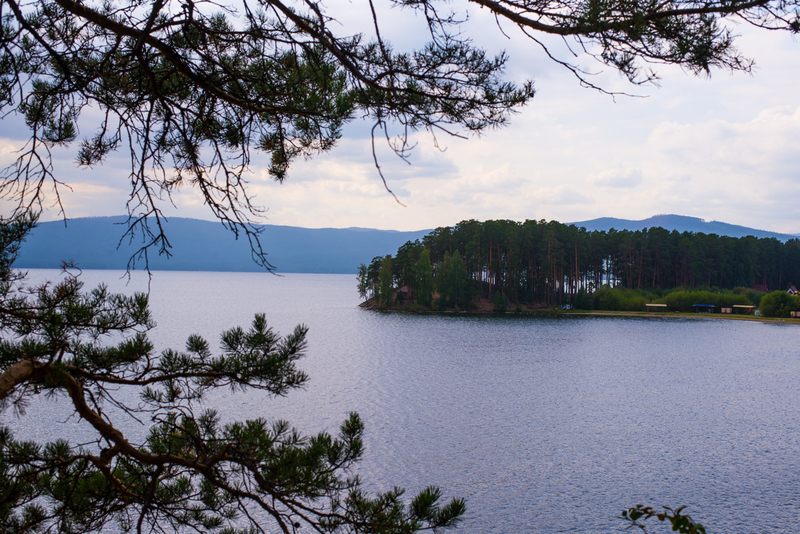 And there is something like 80 lakes in the near vicinity of the town. We drove up, more like climbed up a crazy trail to get a good view. In front you see two lakes, it seems like one, but they are two independent lakes separated by a strip of land no more than 20 meters wide. 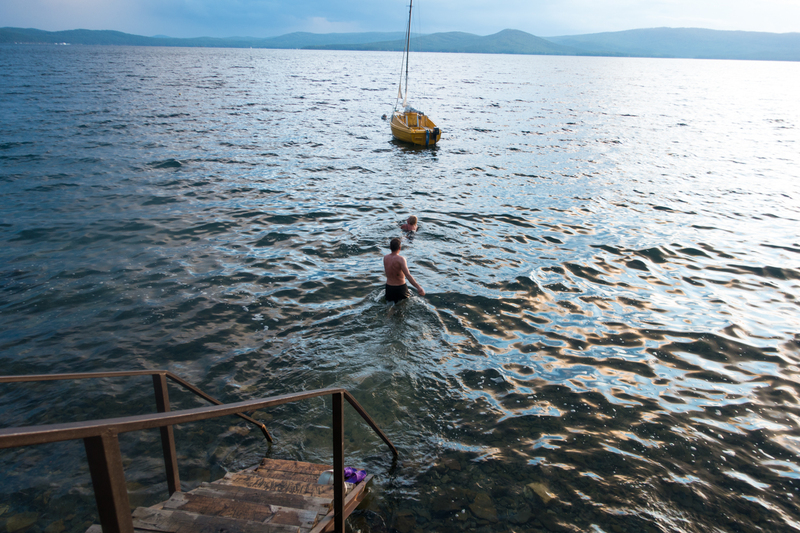 We were smart enough to arrive during the weekend, leaving plenty of room for activities, which Marina and Boris managed to fill up with ease. 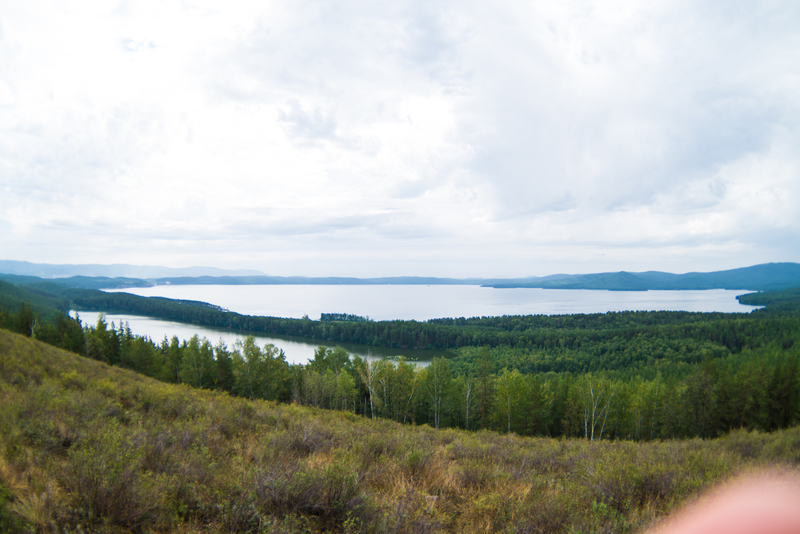 In honor of our initial meeting on Baikal, we managed to find some awesome trails for Korando to fully stretch its legs. 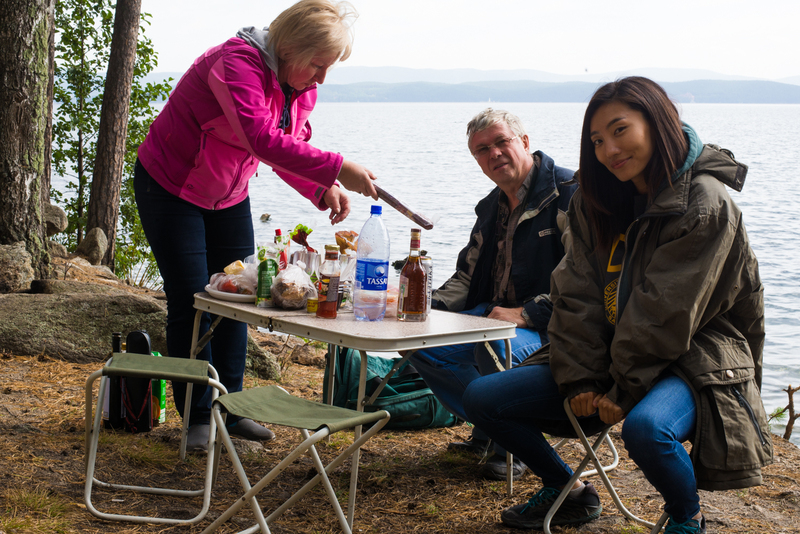 A bit of lunch by the lake… good weather, good food and good people. Idyllic lakes and little island all around the town, people from all over the country come here to enjoy the lakes and pristine nature, but our for our friends this is their backyard! Little presents to remember the visit….i got a “Ural Mountain” flask. I joked that you are not supposed to give it empty, so Marina instantly went to the car and filled it to the brim with cognac! Hyein also got a little present….a box for jewelry, that i was made to promise to fill up with time. 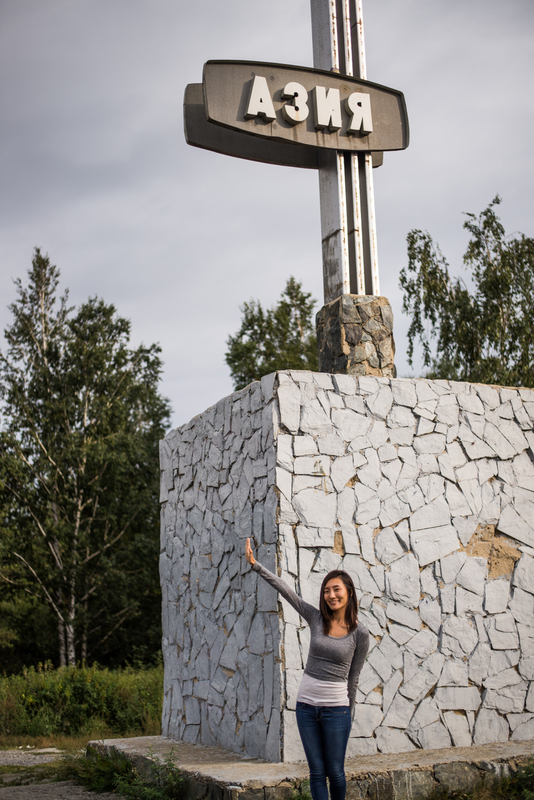 Just west of Miass is the official line that separates Asia and Europe, although the Eurasia continent does not have a natural division line, people have decided to separate it along the Ural mountains. So there is an actual place where you leave Asia and finally arrive in Europe. Everyone honestly thought the sign is going to be a bit more impressive… but we didnt come here for the sign, we came here for the people. 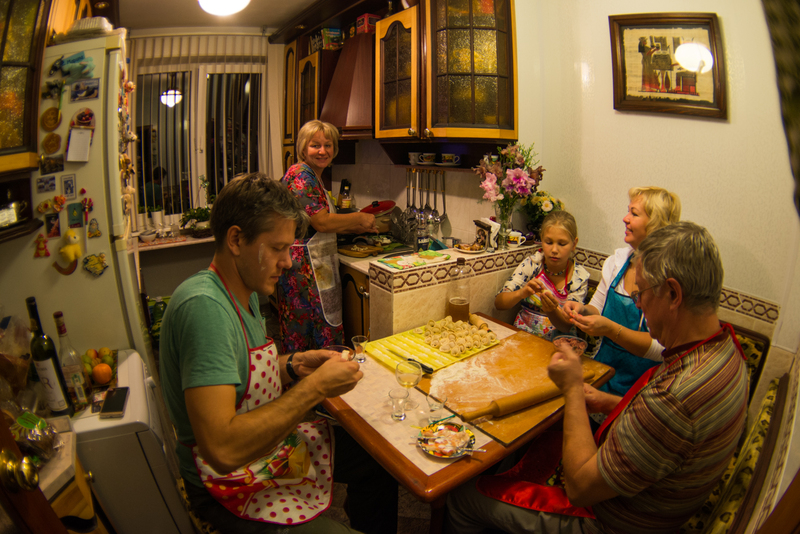 Back at home, we had a real treat ahead of ourselves….a very Russian tradition of making your own dumplings. The hardest part is making the dough from scratch, but with experts this was much easier and more fun than i would have expected. Step number two involves actually cutting the dough, rolling it out, putting meat inside and closing them up. For best results this should be done with all the guests participating and forming an assembly line with dedicated roles. If you have more than 4 people, the 5th person should be the official vodka pourer as this tremendously improves the worker’s mood and quality of the dumplings. If you got a 6th, then you are in luck because now you got an official photographer for the whole thing. 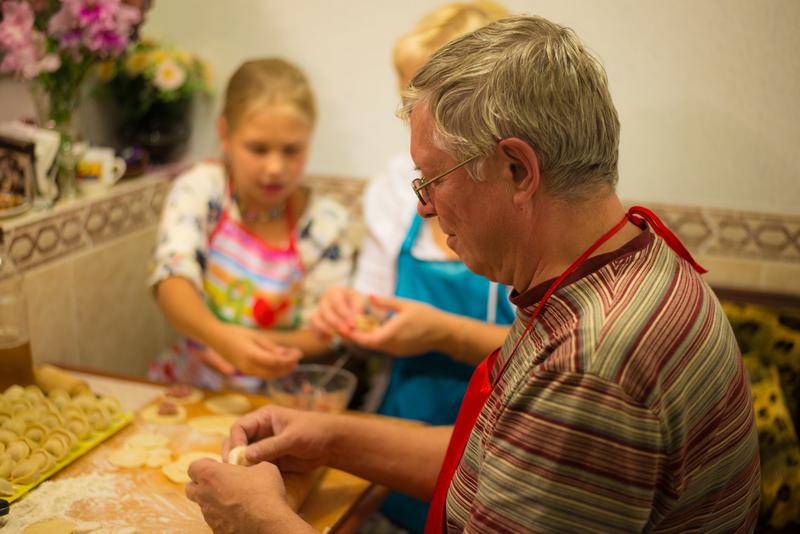 Olya and her daughter Sonya teaching us the proper way of making this delicious treat. 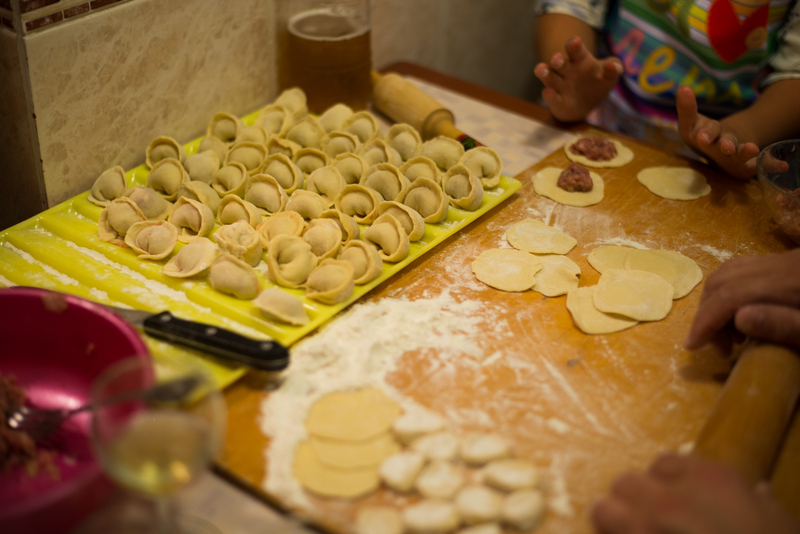 Here you have proof, a bit out of focus, but still proof of my amazing dumpling making skills. I’m not sure how many exactly we made, but thats the point you sit around, drinking, laughing together and in the end you eat what you have made…i perfect kind of dinner party in my mind! 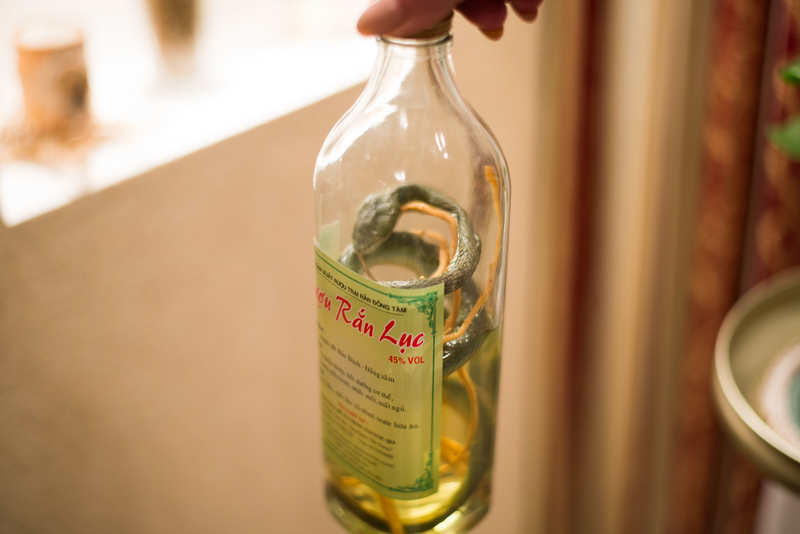 Now this is where things go from good to ….. i dont even remember what happened last night. 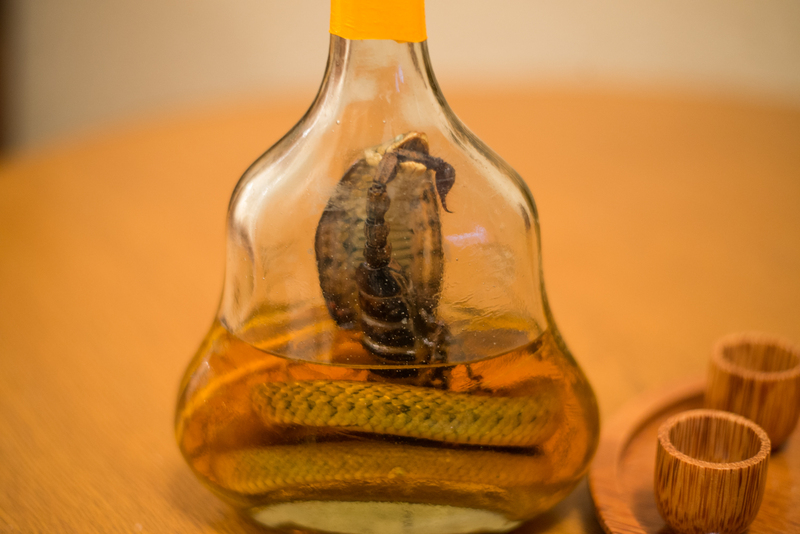 Its probably never a good idea after consuming copious amounts of liquor already, to start drinking something from a bottle with a snake in it, ESPECIALLY if its holding a scorpion. But we did…and all i remember after that an uncontrollable desire to giggle. We said good night to each other and instead of going to sleep, we continued to laugh like mad people…in the morning i had to apologize to our hosts. They smiled and gave us a cup of coffee. If you travel through Russia be prepared. That you will be welcomed and loved, fed and never thirsty. As the Russian hospitality is one of the best in the world. And i know what i’m talking about. If you think that this is enough activities for a single weekend, then you have clearly never hung out with Russian people. 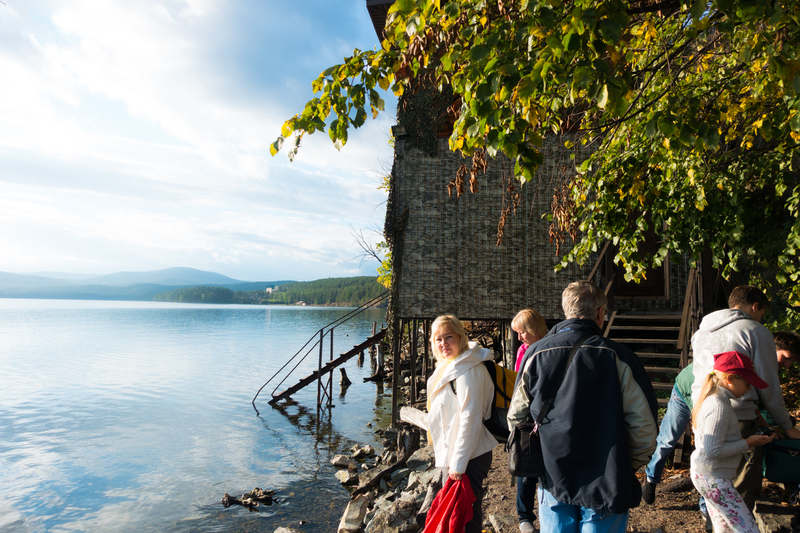 In the evening we reserved a “banya” (Russian sauna) on the coast of this pristine lake. 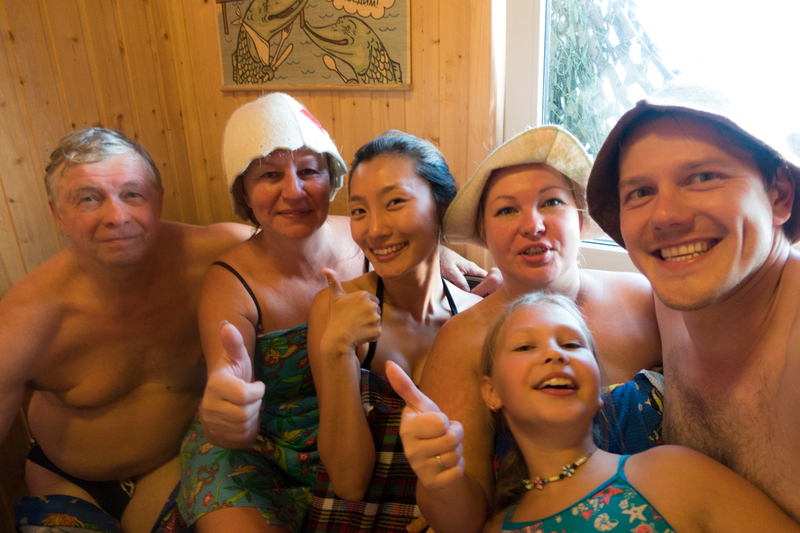 The idea of banya is very simple, you heat up a room, go inside and warm up, then quickly dunk yourself in some cold water. This could be a bucket of cold water, a lake or even a hole in the ice in a frozen lake…whatever you have at your disposal. Testing out the clear waters of the lake for temperature, water quality and most importantly taste! 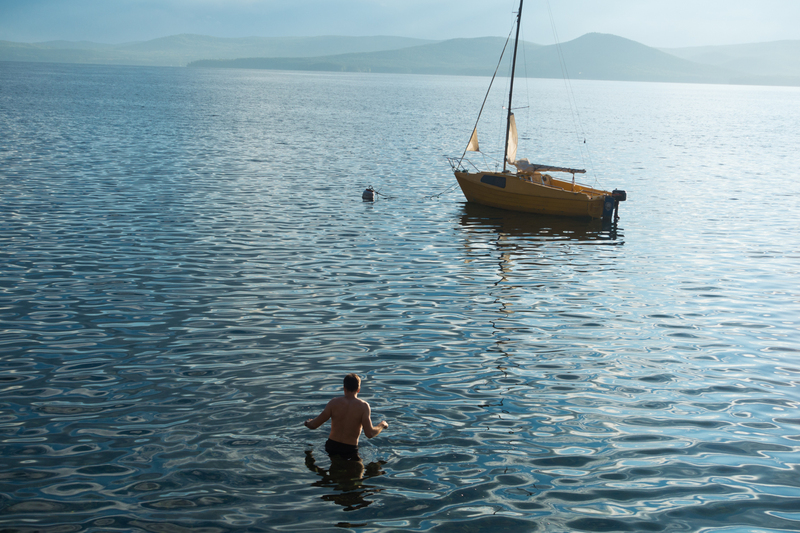 Yup, the water is so clean you can drink it straight from the lake, but i suggest swimming a bit away from the sweat infested waters near your friends. 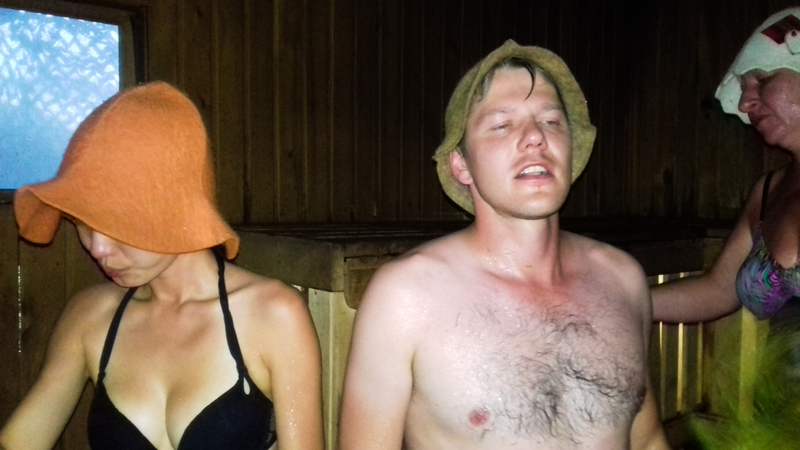 In banya by tradition you have to wear a silly wool hat that will protect your head from overheating. 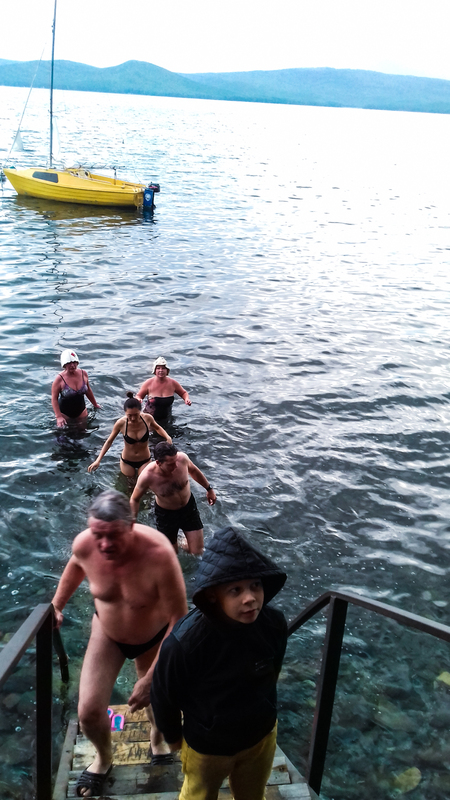 This is where your inner child and creativity comes out, the sillier the hat the more fun you are going to have in the banya….guaranteed. Another tradition is to take some tree branches and mercilessly beat each other with them…i kid, the specially prepared leafed branches increase the circulation and heat applied to your skin. You are NEVER supposed to smack people with them, just gently brush the skin. After you have cooked enough and you resemble a fully done lobster, then its time to jump into the lake. It is true that you are so warm from the inside that no matter how cold the water is…you will never care. Remember that the water under the ice cannot be less than zero degrees…so that basically the limit of how cold you will get. And after spending 20 minutes inside a 100C chamber you can easily stand a few minutes in the ice cold waters. 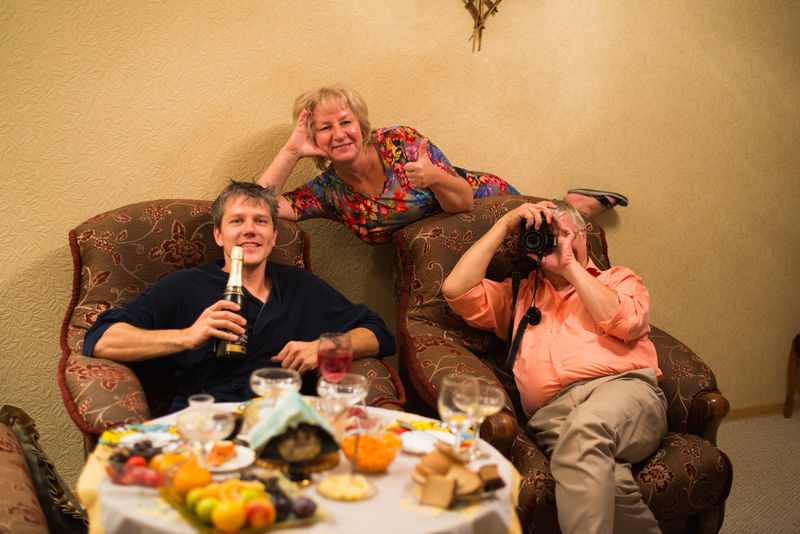 Boris, Marina and Olya brought all the necessary snacks to make this an unforgettable experience. In banya, you are never supposed to get drunk…just have a little bit of beer to replenish the lost fluids and maybe a snack. 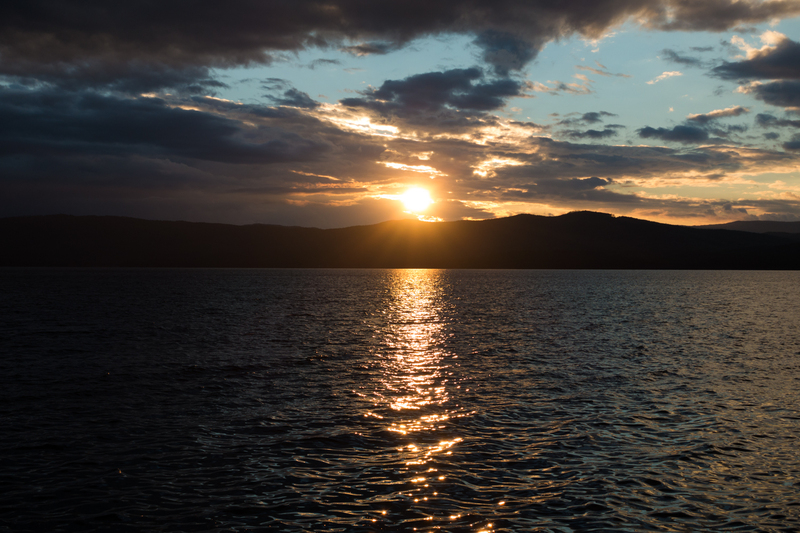 After the water has calmed the fire inside your body, a feeling of pure relaxation washes over your entire body. The only challenge was walking up these stairs to sit down by the table brimming with beer and snacks. This is not just a washing experience, its a cleansing experience for your body and mind. The body aches with pleasure of the warmth and coolness of the water. The beer and your friends’ company make for the best time. You would think that the few cycles of heat and cooling would make you tired, but it gives a lightness to your step. Your aching muscles feel regenerated, your back pain is gone and you are walking on clouds. That is until you accidentally sit down somewhere and rest your head. You will be dragged off to sleep with a might of a tropical storm, nothing can stand in its way. And when you wake up in the morning from the deepest sleep of your life, it will feel like you are coming back to the world from somewhere so far away from reality that it will take you a few hours to realize that you are back on the planet Earth. Thank you to our friends for an unforgettable weekend, now back to the road! Ahhh…, my neck of the woods !! Thank you guys for such wonderful photos !